When making quick hops between shooting positions, keep both hands on the gun. 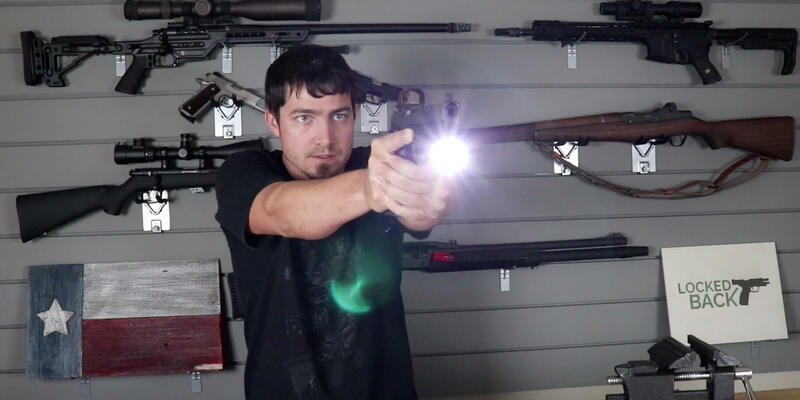 You already have a good firing grip, and you can’t take full advantage of pumping your arms between positions, so just leave both hands on the gun. 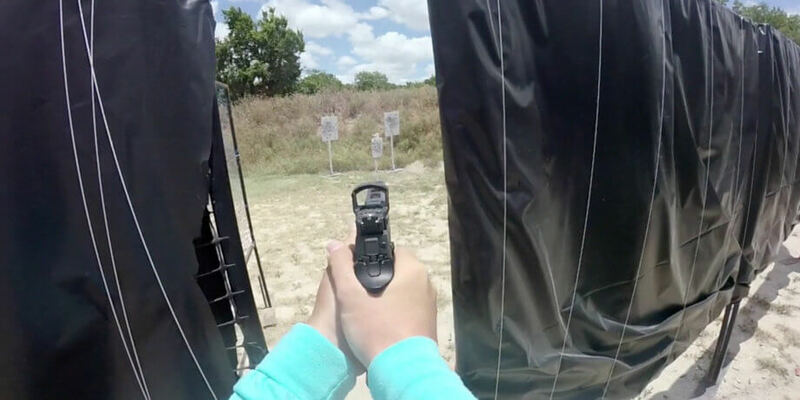 This way, when you get to the shooting position, you can quickly get your sights on target and have the full firing grip ready to maintain recoil. This also gives shooters the option of engaging targets while moving between shooting positions. When two shooting positions are farther apart, the full range of movement for running is of greater help, especially when having to weave. This is when it’s a good idea to take your support hand off the gun and pump your arms. Be careful when pumping your arms while running though, it is easy to point the gun in an unsafe direction. In a competition environment, that could mean a disqualification. In a defensive environment, that could mean breaking the rules of gun safety and pointing the gun at something you aren’t willing to destroy. Guns don’t need to be through a shooting port or past a barricade in order to hit targets. 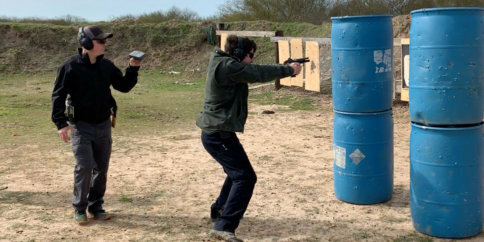 Shoving your arms through a port or past a barricade can not only slows you down by forcing you to move your arms more to clear the barricade, but it also can create awkward shooting positions, keeping you from getting a good angle on a target. Avoid putting your arms through ports and past barricades when possible, this speeds up your transitions. This is also very relevant from a defensive shooting standpoint. You don’t need to be right up against the cover/concealment to take advantage of it. Staying back, away from the barricade allows you to have your sights on target when you lean around it, and it means adversaries have fewer angles to shoot at you. If you have to stay in one position to take a shot, then stay firm in that position. Shifting feet takes time and creates an unstable shooting platform. In the shooting competition world, if you can see several targets from only one spot, then get firmly in that spot so you can clear the targets as quickly as possible. In the defensive shooting world, take a firm stance only if it is a difficult shot, otherwise moving while shooting is usually the better option. If you’ve read any of my previous articles, you know where this is going… dry fire. Dry fire is the key to becoming a better shooter, even when it comes to movement. Setup some targets in your home that you can only see from different positions. 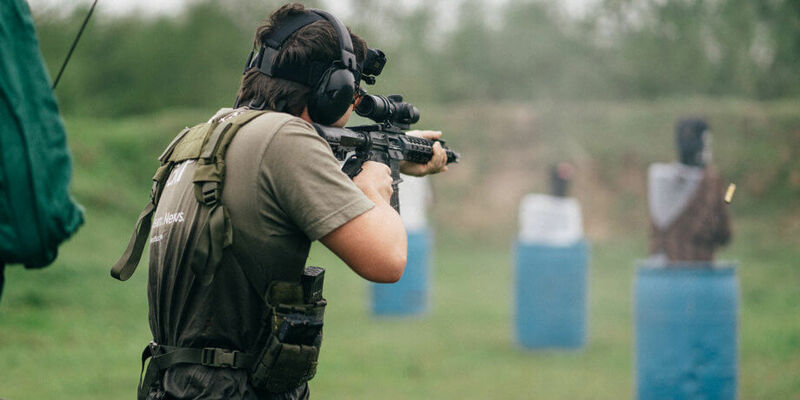 Practice moving between those two positions, focusing on starting quickly, stopping quickly, and getting your sights on target quickly. Setup these positions so you have to go side to side, forward and back, and even work in some weaving if you can.